Some photos are included in this report, to educate on the methods used at OBRL, and the results. If they do not transfer in the email, click on the provided weblinks to get them. Preface: Everything I report in Part I of this Update report is predicated upon conventional radiation biophysics. The issue of the Oranur Effect – of irritation of the life-energy field of the planet and of living organisms – is another matter entirely. I will give some discussion on this towards the end, with recommended reading, in Part II. Since our last Update in early April, no significant increases in radiation have been detected in the atmosphere or snow-rain samples as measured at the OBRL facility near to Ashland, Oregon. Over this full period, there have been no detectable increases in the open-air readings at our location. Real-time monitoring of background radiation levels continues, using a Radalert 100 GM counter (sensitive to x-ray, alpha, beta and gamma). Data are recorded to computer every minute, so as to review trends. Over this full period, since before any arrival of Fukushima radiations, these open-air readings have shown an average of 18 cpm, with isolated transients between 5 to 35 cpm. This is well within normal ranges, and typical of what we have recorded here over many years, even before the Fukushima accident. Over the last several months, there have been no discernable changes in these open air readings, even as some isolated and brief radiation anomalies have occurred in rainwater samples. As noted previously Snow-melt and rainwater samples are also being routinely being tested at our facility. This is being done with both an NaI crystal scintillation detector, and a 2-inch diameter "pancake" type of GM detector. These sensors are mounted inside a sealed cylindrical lead shield into which the sample being measured is also placed. The lead shielding reduces natural background radiation levels inside, allowing any radiation contamination in the rain water or snow-melt to be more easily detected. The detector probes are powered by two separate Ludlum 2200 Ratemeter-Scalers, which allow for precise detector settings and evaluations. Each evaluation run typically lasts for 60 minutes, one hour, with a second control run also inside the lead shield, but without the rain-snow sample under evaluation. 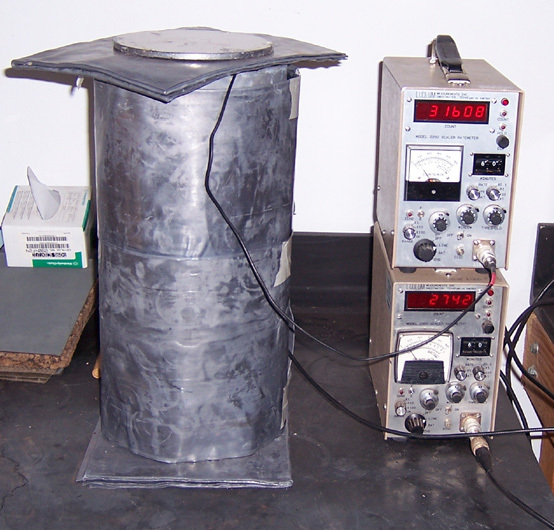 This image shows our two Ludlum ratemeters (at right) with NaI and GM probes attached but contained inside a heavy lead-plate shield (at left). The image below shows the interior of the lead shield, which fully surrounds the samples being evaluated. A glass pitri dish for holding the rain-snow samples can be seen at the bottom, just below the detector probes. As noted in several prior Update notices posted to our weblog (see the list and links at the bottom of this Update), using this system we have occasionally seen small temporary increases in the radiation counts within rainwater or snow-melt. A prior Update report discussed a temporary anomalously high reading on our GM detectors on March 18th. Since then, we have recorded additional radiation anomalies in rain-snow samples which fell on April 2 (an 8% increase in the NaI scintillator) and April 16-17 (a 4% increase in GM counts, and 21% increase in NaI scintillations). On other rain-snow events, for April 1, 3, 5, 8, 15, 17, 22, 23, 25-26, and 28-29, there have been no detectable increases above natural background. For April, which is when we began making these rain-snow measures more systematically, this suggests about one storm system in ten was bringing a bit of the Fukushima radiation with it. However, in both of the cases in April, the radiation in these samples rapidly dissipated after a few hours, indicating the probability of temporary radon emissions due to outgassing, as the water was moved from the chilly outdoor environment, into the warmer laboratory room. This was also the case for rainwater collected on March 18th, as previously described in a prior Update (see Appended weblinks below). While this certainly gives some cause for continued monitoring, as does the ongoing crisis in Fukushima itself, it is not by itself such a large quantity of radiation to warrant alarm. Nevertheless and unfortunately, for this kind of rain-snow evaluations, we have no pre-Fukushima baseline of measurements by which to compare them. 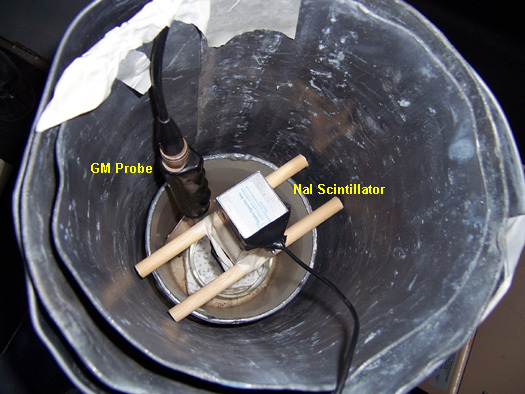 And this kind of evaluation, using simple count-rate measures using GM and NaI scintillators inside a lead shield, gives us no information by which to identify specific radionuclides, if any, that might be found in the water. I am only speculating that the effects were due to radon contamination, based upon their quick disappearance. If the rain-snow samples had been contaminated with something like radioactive Cesium or Iodine, which are known to have been discharged from the Fukushima reactors during the explosions, the measured radiation levels would have persisted over many days (for Iodine 131) or many years (for Cesium species), and not for only a few hours. However, we have better instrumentation on order, where specific radioisotopes can be determined, and so some of this uncertainty will be removed in our future evaluations. What tentative conclusions can be drawn from this? Obviously, the readings at our Ashland, Oregon mountain-top constitute only one location, and measured readings from other regions are necessary to truly know just how much of the radioactive discharges from Fukushima are reaching across the Pacific Ocean. The prior Updates give several excellent radiation-monitoring weblinks, and so far they also show similar results to what I give above: Only occasional, temporary bursts of detectable radiation, but nothing which is persisting or widespread. There are isolated and scattered reports of slightly elevated radiation levels in rains and milk, but these are so far typically isolated examples which appear, and then disappear just as quickly. Nobody in North America is, to my knowledge, as yet detecting consistent, persisting and significant radiation increases as found in rains, soils, or milk – and from that one may legitimately conclude vegetable material would be safe. In Hawaii, there have been a few periods of with reproducible or repetitive higher readings, but even there, it has not yet provoked any official alarms. The same is true in Europe, even further removed from Fukushima, from our information, even while some internet sources are raising concerns. 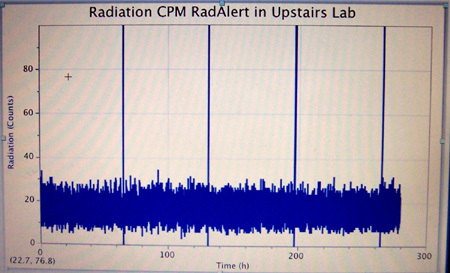 While I cannot hope to monitor all of what is said or claimed on internet, what I have seen so far appears to be the result of confusions about how much radiation constitutes "significant levels", at least from the conventional viewpoint of orthodox radiation biophysics. The issue of short-term versus long-term exposure levels are most frequently mixed up, or ignored. For example, this alarming report came from Natural News, claiming "Fukushima radiation taints US milk supplies at levels 300% higher than EPA maximums". The dates of those two events are close enough to the April 2nd and 16-17th radiation anomalies detected at our facility to suggest a possible connection, resultant from Fukushima discharges. Also see here for rainwater samples over the same period. These higher readings are understandable given Hawaii’s geographical location half-way from the USA to Japan. But in both cases, at our facility, and also for Hawaii, the levels were not alarmingly high, and did not persist, nor were reflected in larger regional measures. For example, if one compares the 24 pc/l of a few isotopes measured in Hawaii, to the EPA’s long-term exposure limit of 3 pc/l, then it does appear alarming – but the EPA figure only merits a strict attention if those Hawaii readings were to persist over a year or longer. So far, there is no indication this is the case. By comparison to the FDA’s short-term exposure limit of 33,000 pc/l, the measured 24 pc/l from Hilo Hawaii, appearing only on two samples over several months, seems less of a problem. The Natural News editors appear to have confused the issue of short-term versus long-term exposures. This problem aside, I still have a much better trust in the Natural News as an information source, than the FDA or AMA for my information on health issues. As one of my professor friends put it, "there are fewer errors of basic assumption in the literature sold in the average health-food store, than in the literature of the average medical school library". The main thing to keep in mind here, is the measured levels from Hilo Hawaii, which are the highest levels so far detected outside of Japan (that I know about) are less than 1/1000th of that short-term level. If all those stations reporting "Non-detect" had instead registered some kind of readings for most of the given dates, even at very "low levels", then indeed we would indeed have a major crisis on our hands. But that is not the case, except for the people living in Japan. Japan recently upgraded its nuclear disaster to "Level 7", equal to that of Chernobyl, so they really do have a major radiological crisis to deal with. My experiences with the Chinese atomic bomb fallout which hit Pennsylvania are also relevant, as described in the Update #5 posting. In that situation, radiation recorded at the soil surface and in rains was about double that found in the open-air background. In that case, nearly every station in the region was detecting considerable radiation, a doubling of background counts which persisted over weeks, and sales of milk were banned. So far, here in North America, and in Hawaii and Europe as well, we are not even close to that critical situation. Consequently, based upon these facts about measured radiation, I must weigh in against the calls for panic, with some cautious skepticism about what is circulating on internet. Distance from the Fukushima reactors allows for dissipation or dilution, as well as for decay of activity level over time, plus the raining-out of radioactive aerosols or gasses. The greater this distance, the less are the effects going to be. People in Japan are the primary ones at risk. The rest of us are wise to keep aware and alert, but panic seems unjustified and unnecessary. If you don’t know what this term oranur is, then it is suggested to obtain the book Selected Writings by Wilhelm Reich, and review the chapter-section on "The Oranur Experiment". This experiment demonstrated how small amounts of atomic radiation, even when shielded behind thick lead, could trigger a tangible and visible reaction in the atmosphere, which could in turn elicit strong biological reactions to people so exposed. In his experiment, Reich placed a small quantity of nuclear material (far less than even in a fraction of an atomic fuel rod) inside a strong orgone accumulator, against which the orgone energy field (or life-energy field) of his laboratory and region reacted powerfully. The laboratory room glowed bluish, people got sick, lab animals died, the atmosphere turned greyish, and radiation detectors reacted erratically. Oranur had two aspects, one of which could be deadly if strong enough, and another which in milder doses could trigger a "healing crisis" and had curative powers. Reich’s work on "oranur medicine" as he called it, had hardly begun at the time when the FDA began its persecution of him, with the book-burning and so forth. But it was clear, oranur is related in some unclear way with the principles of hormesis – of possibly life-beneficial effects from low-level nuclear radiation. In such circumstances, people are not benefiting from the atomic radiation itself, but rather from the reaction of the life-energy field of the room or hot spring "radon waters" to which they are exposed. This principle is typically abused by advocates of atomic energy, to falsely claim that isotopic contamination and higher radiation levels have "no effect", and of course rational criticisms then come from environmentalists who can show the increased mortality from low level radiation – but they then may irrationally dismiss hormesis as a real thing. Neither side wishes to address Reich’s findings, unfortunately. Especially of interest are the eye-witness reports made by people around TMI during the accident there, of an intensive blue-glowing atmosphere (seen also at Chernobyl and Fukushima) which are in full agreement with the observations of Dr. Reich during the oranur experiment he conducted. From this kind of evidence, even with low levels of marginally detectable atomic radiation as we are seeing in Hawaii and North America, we may anticipate some unknown level of increased atmospheric and biological agitation. Certainly this already is the case in Japan near to Fukushima, but it is unclear how far and widespread this might go. This would appear as a flaring up of skin conditions, the temporary appearance of old health issues, or a flaring of people’s emotions. It can also appear as a general increase in human energy level, along with other mild biological reactions or symptoms as detailed in the above PDF document. With mild or severe oranur, some of these reactions will be irritating or life-negative in nature, while at lower intensities, some of the reactions may be life-positive. We can speculate, for example, that the 1986 accident at Chernobyl put enough diluted oranur-irritating radiation into the atmosphere of that region such that, aside from the clear biological damages, it also stimulated a biological reactivity towards heightened activity and increased energy level. And so within a few short years people had increasingly stood up to repressive communism, tore down the Berlin wall, threw out the Communist Party killers and reorganized their societies along more healthy directions. Reich likened oranur to a raging lion, which then tries to smash out of whatever cages are thrust upon it. The normal quiet and relaxed, slow and mellow condition of the orgone continuum turns towards a frantic and highly irritated condition. In the present circumstances, we cannot yet draw any parallels from the Fukushima catastrophe to the social reactions which developed in East Europe and Russia after Chernobyl. Japan is already a very free society, so one does not anticipate rebellions against authoritarianism there. However, this may eventually affect mainland China, a repressive and murderous communist dictatorship. The current spate of rebellions against Muslim dictators was already going at least two months before the Fukushima accident, so that cannot be attributed to it. And in any case, the Islamic uprisings are only partly freedom-directed. The major component of that social unrest is Emotional Plague plotters who wish merely to construct a better and even more constraining social cage, in keeping with radical Islamic demands. It seems doomed to merely change the old dictators for newer, more dangerous ones. "Meet the new boss, same as (or worse than) the old boss". But we have also seen incredible atmospheric reactions which might be related to Fukushima: the massive drought-wildfires across Texas, and the geographically-connected historical outbreak of killer tornadoes in the USA, which wreaked havoc across large areas of the American South only a few days ago. Even here, caution is necessary for our interpretations, given how wildfires and other very severe tornado outbreaks occurred as far as back as records have been kept, well before the era of atomic power or bomb-testing. But these are interesting correlations, nonetheless. Be aware also, Reich’s experiments with laboratory mice charged up inside the orgone accumulator showed they withstood the toxic effects of atomic radiation better than control mice. So if you are concerned about atomic radiation exposure, then moving towards a diet, lifestyle and environment of more healthy life-energy charge and quality is the best guarantor of health. See Reich’s books, and my Handbook for details. Thanks, finally, to all those who sent informative articles, and contributed towards purchase of our forthcoming radiation-detection instrumentation. We are still down about $5000 on that, for those who can afford to donate (see here). This entry was posted on May 5, 2011 at 1:33 PM and is filed under Uncategorized. You can follow any responses to this entry through the RSS 2.0 feed. You can leave a response, or trackback from your own site.